Everybody loves Christmas Dinner, but if you're the one making it it's easy to get stressed. We've all experienced underdone turkeys, overcooked sprouts and roast potatoes hard enough to break teeth, and the fear of following in those foul footsteps is enough to intimidate any amateur chef. But fear not: with the right gadgets you can create the kind of meal people will rave about for years to come. Here's our pick of the top tech for turkeys and veggies alike. One of the hardest things about making Christmas dinner is getting the timings right: it's a constant parade of “stick this in at that temperature” and “do this then”. We've long since abandoned our trusty “cover the kitchen in Post-Its” method and switched to a smartwatch instead: unlike Post-Its, our smartwatch notifies us of what we need to do when we need to do it - and we can mess around with its apps in between cooking tasks, turning our smart lights into something suitably festive or just checking whether we'll have a white Christmas. Your phone or tablet can be a real help when you're cooking a big meal. We keep our favourite recipes in apps for easy access (and easy creation of shopping lists), and it's great to have YouTube tutorials for everything from how to cut veggies to how to operate kitchen gadgets. We know that from experience: after half an hour of trying and failing to open up our new juicer, we turned to YouTube and discovered how to do it in ten seconds. And of course, you can use your phone or tablet to stream festive tunes to your TV, stereo or wireless speakers. If you only consider one gadget from our round-up, make it this one: a good, reliable, fast thermometer is a must-have for any kitchen, and it's particularly important at Christmas. That's because the difference between the temperature your oven says it's at and the temperature your oven's actually at can be frighteningly big, so following cooking times to the letter doesn't always guarantee that the food's actually cooked. The Thermapen's our favourite, and while it's a little pricey it's an all-year-round device that's just as useful for grilling and barbecuing. 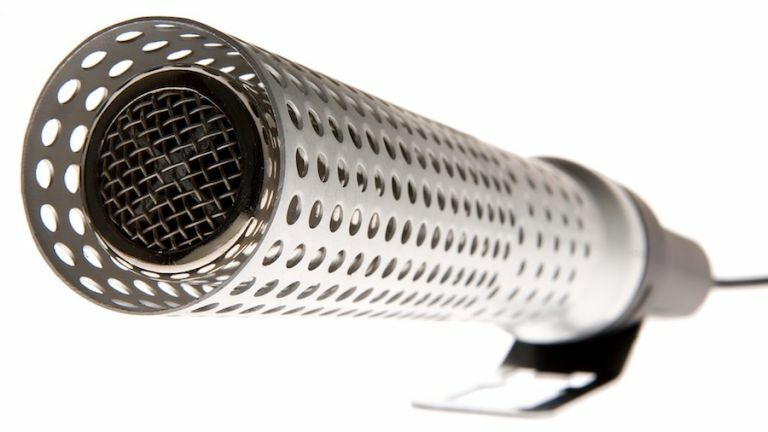 We love it when a gadget made for one thing ends up being used for something completely different, and the Microplane is a great example: it was invented in 1990 as a super-sharp plane for woodworking, but these days it's more likely to be used with Parmesan than pine. Microplanes are super-sharp graters that are particularly good for zesting fruit - important for a Christmas cake and many puddings - and for making delicate threads from the hardest cheeses. Poor quality knives are a false economy: they blunt easily, and blunt knives are dangerous because they slip. But a really good knife isn't just a way to ensure you finish your food prep with the same number of fingers you started with. It's a joy to use too, and can take your presentation to a whole new level. Top chefs go for famous (and famously pricey) brands such as Wusthof, but you can get similar quality for less by checking out brands such as Mac. If you've already got a food processor you may be wondering why you'd want a hand blender too. The short answer is that you can't chuck a Kenwood Chef into a bubbling pot of soup. Small enough to stick in a dishwasher and big enough to get the job done, a hand blender will turn a big pot of leftover veg and stock into a silky-smooth soup sensation. You can get cordless ones but if like us you're always forgetting to charge things, a wired one is a better and cheaper option. Digital scales are handy for all kinds of cooking, but if you're a budding Bake Off contestant they're even more useful: when you're baking, especially if you're baking light things, there's precious little margin of error when it comes to weighing ingredients: a little bit too much of this or too little of that can turn your cookies into concrete or your doughnuts into doorstops. A decent set of kitchen scales costs next to nothing and makes a big difference to your baking. Some of the best kitchen gadgets are low tech, such as Joseph Joseph's garlic rocker. It solves a simple problem that many cooks know too well: the problem of getting crushed garlic out of a garlic press. With the rocker, all you need to do is rock it on top of the garlic cloves while pushing downwards, and the garlic pops through the holes into the middle for easy scraping into a pot. It's dishwasher safe too. We'll admit it, this one looks a bit over the top and it's not something you want to use to brown the turkey or a rib roast. But if you're cooking your Christmas dinner outside, the Looftlighter is fantastic: it creates a jet of superheated air that turns damp charcoal into glowing orbs in minutes, so you can get your grill on when even traditional firelighters can't get the barbecue started. It's also really handy for lighting fires, and for pretending it's a bazooka when nobody's looking. There's even a bottle opener in the handle.